For years you’ve heard you should reduce the amount of saturated fat in your diet to lower your risk of heart disease. This is based on the assumption that eating a diet high in saturated fat raises your cholesterol level, and an elevated cholesterol is a major risk factor for heart disease. Unfortunately, when people reduce the amount of fat in their diet they typically replace it with processed carbs. Why is this a problem? There’s growing evidence that processed carbs and sugar may be as much of a threat to heart health or an even greater threat than saturated fat. Here’s why. Cholesterol and Heart Disease: What’s the Link? There are actually two types of cholesterol circulating in your bloodstream – LDL-cholesterol and HDL-cholesterol. LDL-cholesterol is the form of cholesterol most closely linked with heart disease whereas HDL-cholesterol seems to have cardioprotective effects. Based on this, you might assume it’s the AMOUNT of LDL-cholesterol in your bloodstream that’s important for determining heart disease risk , but this isn’t necessarily the case. There’s growing evidence that oxidation of LDL-cholesterol and inflammation inside the walls of arteries may be a greater threat. The scenario goes something like this. Blood vessel walls become damaged. This can happen due to chronically elevated blood pressure or it can be a product of chronic insulin resistance due to a diet high in sugar and processed carbs. Insulin resistance increases visceral fat, and visceral fat releases inflammatory chemicals called cytokines that can damage the walls of blood vessels the same way high blood pressure can. This pro-inflammatory state oxidizes or damages LDL-cholesterol and the oxidized LDL-cholesterol attaches to arterial walls. This activates the immune system, creating even more inflammation and damage. As the damage accumulates, scar tissue is laid down, causing plaque formation. These plaques can then rupture and lead to a heart attack. The driving force behind heart disease may be blood vessel damage and oxidation of LDL-cholesterol due to chronic, low-grade inflammation. 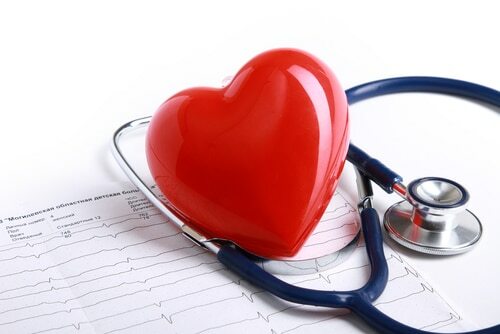 Of course, the inner walls of blood vessels can become damaged in other ways, most commonly from high blood pressure. But when it comes to the cholesterol issue, it may not be the total amount of LDL-cholesterol that’s important but the amount that’s OXIDIZED. If so, it may be more important to eat an anti-inflammatory diet, like a Mediterranean diet, than to focus on how much saturated fat you’re eating. Interestingly, one large meta-analysis showed that people may be predisposed to heart disease because they’ve inherited mutations in genes that predispose them to inflammation. The problem is it’s hard to show cause and effect. It’s possible that inflammation may be a consequence of heart disease and plaque formation rather than a cause. How do you know if you have low-grade inflammation that places you at greater risk for heart disease? You can measure levels of an inflammatory marker called C-reactive protein through a blood test. Higher levels of this inflammatory marker have been linked with a greater risk for heart disease. Experts believe one way statins lower heart disease risk is not only by lowering cholesterol but by reducing inflammation. The Mediterranean Diet: The Ultimate Anti-Inflammatory Eating Plan? As you might expect, diet plays a role in inflammation, and the Mediterranean diet has been linked with a lower risk for heart disease. It’s also a diet rich in anti-inflammatory omega-3 fats and heart-healthy monounsaturated fats and low in sugar. It also provides support for the idea that inflammation plays a role in heart disease. In a study called the Lyon Diet-Heart study, researchers placed men with risk factors for heart disease on either a diet low in saturated fat and cholesterol or a Mediterranean diet rich in omega-3s from fish and monounsaturated fats from nuts and olive oil. The researchers chose to terminate the study before completion. Why? The men who ate the anti-inflammatory, Mediterranean diet experienced an unexpected 70% reduction in heart attacks and it would have been unethical to continue. Interestingly, the LDL-cholesterol level in the men eating the Mediterranean didn’t drop. Despite no change in cholesterol, the men experienced significantly fewer heart attacks. The reason? Experts believe it’s because the Mediterranean diet is an anti-inflammatory one. Research already shows the Mediterranean diet has also been linked with a lower risk for other health problems including stroke. There’s growing evidence that low-grade inflammation is a risk factor for heart disease and that LDL-cholesterol is most dangerous when it’s oxidized because it can damage arterial walls. Diets high in sugar and processed foods may contribute to low-grade inflammation. Fortunately, adopting a Mediterranean diet seems to offer some protection against heart disease and other health problems as well. At the very least, reducing the amount of processed food in your diet and eating more fruits and vegetables can lower your risk for heart disease. Something to think about when you make your next trip to the grocery store. Natural Solutions Magazine. March 2013. pages 63-65. N Engl J Med 2013; 368:1279-1290. Can Your Lifestyle Change Your Metabolism?